In his otherwise excellent review of the book Werner Scholem: A German Life by Mirjam Zadoff, Dona Geyer, Steven E Aschheim chooses to leave out a critical piece of history. For reasons unknown, he decides to leave out the relatively well-known fact that Scholem was a member of the German Left Opposition. “The itinerary of Werner Scholem, one of the most attractive of this group of young post-war leaders is beginning to be known. He refused, like Max Hesse – another veteran of the insurrection prepared in Moscow in 1923 – to support the line which led Fischer and Maslow to capitulate and resigned in February 1928 from the Leninbund, advancing reasons which could have come from Trotsky. As an attentive observer, during a momentary tactical diversion, while he resumed his advanced legal studies to qualify as a lawyer in Berlin, he was attracted by Trotsky’s analyses. In 1931 in Berlin he made the acquaintance of Leon Sedov, and this meeting marked the beginning of a regular collaboration with Trotsky’s German comrades, weekly meetings with E. Bauer and drafting (unsigned) articles for Die Permanente Revolution. 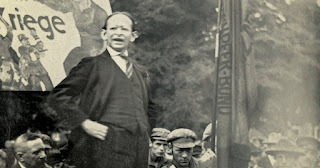 He expressed the desire to meet Trotsky, who, for his part, keenly wished to meet a man of his quality and his talents. But in the end, it was Trotsky who opposed his proposal to travel, not wanting someone like Scholem to run the risk of finding himself in Turkey at the moment of the decisive struggle on German soil. Scholem first emigrated to Czechoslovakia, and then returned with underground links to the Left Opposition, and was arrested. The Nazis were not going to let this prey escape, a Communist, an intellectual and a Jew. "He was savagely tortured and, it appears, was executed or struck down in 1939. It is curious that the Trotskyist current has not laid claim with greater enthusiasm to this martyr, who nonetheless did belong to it. Winning him to their ranks, as well as his heroic end, did them credit. The final adherence of this young German leader, who had organised the campaign of signatures for the Letter of the 700, when he joined the international organisation founded by Trotsky, was not just an episode. It demonstrates that it is ridiculous to try to counterpose the course of the Russian Opposition to that of the German Opposition or vice versa. We have tried here to introduce a little clarity into episodes which invite us not to seek scapegoats for errors of tactics so much as to pose serious and with respect for the subject the problems which arose from what the Russian Opposition very correctly at the time called “the crisis of the revolution”.